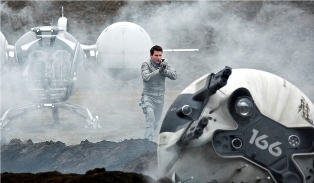 Oblivion, starring Tom Cruise, is a visually stunning post-apocalyptic sci-fi thriller with a weak plot. Set in the distant future, the Earth has been decimated after aliens blew up the moon. The few humans that remain have been relocated to Titan, one of Saturn’s moons. The only inhabitants of the planet are a few human workers and the alien “scavs” (scavengers) that invaded the planet. 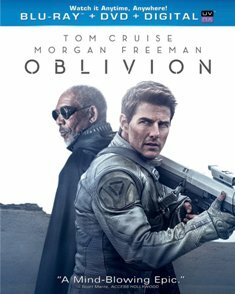 Oblivion borrows so heavily from other sci-fi canon that it hardly carries any weight of its own. The cool post-apocalyptic atmosphere and an engaging performance from Cruise kept this film just entertaining enough to keep my attention through the end. Oblivion is an exploration of identity. In a world with so few people, do individualism and identity matter? It does to Jack Harper (Cruise). His sole purpose in life is to maintain drones that protect the power stations from scavs. The scavs are what remain of the aliens that invaded the planet. Harper and his partner Vika (Andrea Riseborough) live in a domicile mounted on a tall pole that rises above the Earth’s surface. For security purposes their memories have been erased, though Jack is haunted by dreams of a past that took place long before he was born. While Vika is content to serve out her duty, never stepping foot on the ground, Jack loves exploring the few relics of the past that remain on Earth. He has even set up a secret hideaway where he stores souvenirs such as old books and sports memorabilia that he has collected. It’s there that Jack has gained a sense of who he is. He reads classic literature, listens to Led Zeppelin, and dreams of a life he cannot have. The Earth is barren, the moon hangs in pieces in the sky, and there are no other people for him to connect with. The only other human contact is from his boss Sally (Melissa Leo) who communicates to Jack and Vika from the “Tet,” a space station orbiting the Earth. Sally is not much of a companion, her only interest is whether the drones are functioning or not. It’s a great setup, but the story loses its drive in the second half. The film borrows ideas from films like The Matrix, Total Recall, and Planet of the Apes (just to name a few), never developing a strong point of its own. As Jack struggles to find himself, he soon realizes that things aren’t exactly as they seem. As Jack makes new, and surprising, discoveries about the world around him, the plot begins to unravel. As the truth unfolds the story loses focus and in the end does not make a whole lot of sense. 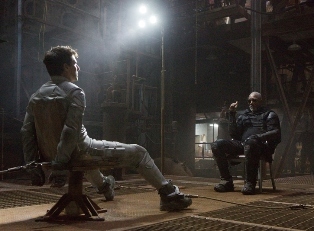 The Blu-ray offers an insightful commentary from Cruise and director Joseph Kosinski. The 48-minute ‘making of’ documentary “Promise of a New World” provides an in look at the production of the film. A few deleted scenes and an isolated score track round out the special features. The audio and visual presentation is beyond excellent. The vast empty landscapes are captured beautifully while Jack’s lush green oasis stands out in contrast the barren Earth. DTS-HD MA 7.1 audio is excitingly enveloping. 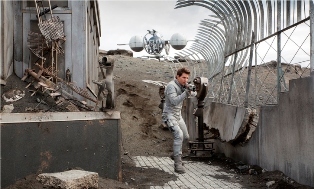 Overall, I would give Oblivion a moderate recommendation for sci-fi fans. The concepts are well-worn, and the storytelling sloppy, but there’s just enough there to keep things interesting.